Recently crowned as the North-West University’s (NWU’s) Miss Varsity Cup 2019, third-year student Lesego Sathikge is an excellent example of beauty with brains. When asked about what she wants to achieve during her term she says she would like to change people’s general perception about what Miss Varsity Cup is. “A lot of people think that it is only about looking pretty, and I want to change that perception. I was crowned to not only be a great ambassador for the university, but also to empower and serve as a role model to young women across all races,” she says. Lesego kicked off her modelling career at the tender age of 10. After two years of taking part in beauty pageants, she decided to stop for a while. However, her love for modelling resurfaced again in high school and she started to take part in competitions again. This year she took part in Miss Varsity Cup for the very first time. She says she would love to venture into commercial modelling, but would also like to further her studies by enrolling for an honours degree. Lesego will compete against all the national Miss Varsity Cup winners from various universities on 15 April. The NWU knows she will fly the university’s flag high and wishes her well on her quest. 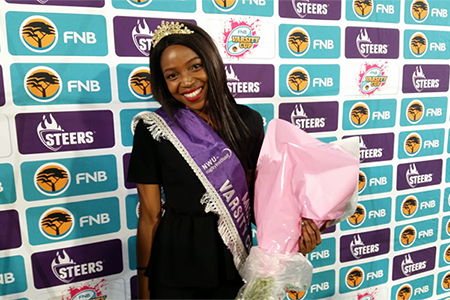 Meet the NWU's Miss Varsity Cup 2019, Lesego Sathikge.